Danieli telerobot labs gives its customers what they expect: competence, collaboration, concreteness, understanding of the need. Operations in the steel industry, in nuclear, off-shore as well as medical field. Different environments but same needs and challenges posed by dangerous, inaccessible or extremely delicate scenarios that have cross-cutting issues in common: the safety of people, the protection of the environment, the profitability of the result. Common problems that very often need uncommon solutions to perform operations that man cannot do by himself, which cannot be done without, that a machine alone cannot fulfill. Danieli Telerobot Labs provides a complete range of robotic solutions for complex conventional and unconventional operations in the field of Metal industry, Energy, Health and Advanced applications offering high level competences and turnkey solutions: robot design and manufacturing - special, custom design as well as industrial robots integration – and technology transfer "in the field" of the most advanced technical solutions from Research and Academia. Complete project definition, execution services and products: from feasibility and conceptual studies to integrated solutions combining design, engineering, procurement, manufacturing, tests and qualification, field constructions and after-sale services. 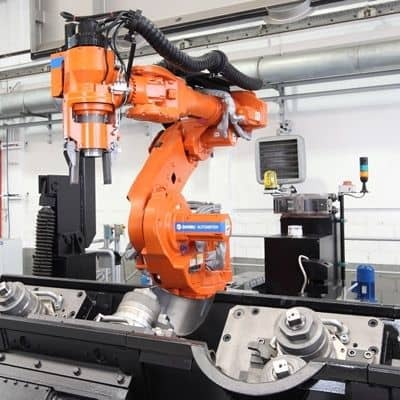 Robotic applications created to help the operator to work better and safer, the most advanced alliance between industrial robotics and process automation in each production area: furnace, casting, rolling mills and process lines. Remotely operated robots, autonomous vehicles and special machines for oil & gas pipelines inspection, maintenance and service, remotely operated interventions in nuclear plants - inspection, maintenance, decommissioning, safety actions.